During the picturesque autumn days in Myrtle Beach, South Carolina, the “in” thing is the “ing” thing. You know — the “ing” activities, like golfing, fishing and paddleboarding, just to name a few. In fact, there are so many fun outdoor activities to experience on the Grand Strand in the fall that it's almost impossible to do them all, but you are certain to have a wonderful time trying. * Biking/Hiking: Get some exercise and cover some new ground by biking or hiking your way around Myrtle Beach. Ocean Boulevard features bike lanes and sidewalks that can carry you to some nearby trails at The Market Common and Myrtle Beach State Park. The Market Common features biking and hiking trails around Grand Park, and Myrtle Beach State Park's Sculptured Oak Nature Trail offers a scenic stroll through maritime forest all the way to the beach. If you head north, the Golden Mile and Cabana Shores stretches of Ocean Boulevard are breathtaking. * Fishing: The fish are usually biting in the fall season, and even if they're not, you still get to spend a lovely autumn day on the water. Anglers have lots of options for wetting a line, from the simpler sport of surf fishing from the comfort of the beach to chartering a deep-sea fishing boat and heading way out in the Atlantic Ocean. But the most popular and trouble-free way to spend the day fishing is at one of the many local piers. The Second Avenue Pier is a short stroll down the Boardwalk for Bay View guests, and Myrtle Beach State Park also has its own fishing pier. Both have tackle shops where you can rent or purchase gear, obtain the proper fishing licenses, and stock up on bait, snacks and tips. * Kayaking/Paddleboarding: There truly is no better way to discover the hidden beauty of the Grand Strand than via a kayak or paddleboard, which allow paddlers to reach backwater places that can't be accessed by vehicles. The quiet modes of transportation let you sneak up on nature and take in the scenery undisturbed. 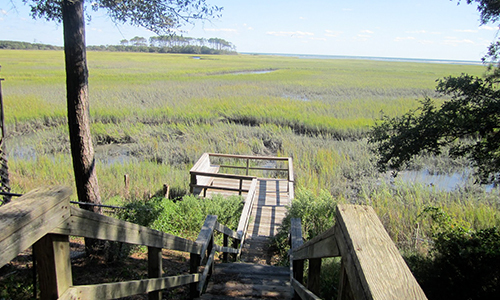 There are lots of secret spots tucked away on the Waccamaw River, at Huntington Beach State Park and in the Lowcountry creeks and inlets around the Waccamaw Neck. Glass Bottom Kayak Tours offers amazing tours to Waties Island, and Kokopelli Surf Camp offers paddleboard rentals, lessons and tours. * Running: Whether you prefer organized road races or just love to go for a run on the beach, the Grand Strand offers plenty of opportunities to do both. Bay View on the Boardwalk guests can head to the beach and turn north or south for a scenic jog in the sand. For a more social experience, the Oct. 21-22 Myrtle Beach Mini Marathon attracts runners from all over the country to enjoy the camaraderie and the scenic 13.1-mile course that covers 5 miles of oceanfront. The Coastal 5K and Doggie Dash allow runners of shorter distances to get in the act, and there are other 5K races held on weekends throughout the fall. * Water Sports: The ocean temperatures on the Grand Strand remain warm well into fall, creating the perfect environment to try some new water sports. Surfing is a fun way to spend a sunny day at the beach, and more advanced activities like kiteboarding, jet skiing and windsurfing add a little adrenaline to your saltwater leisure. For nature lovers looking to soak up all the scenery Myrtle Beach has to offer, book your fall vacation at Bay View on the Boardwalk and get ready to get outdoors.